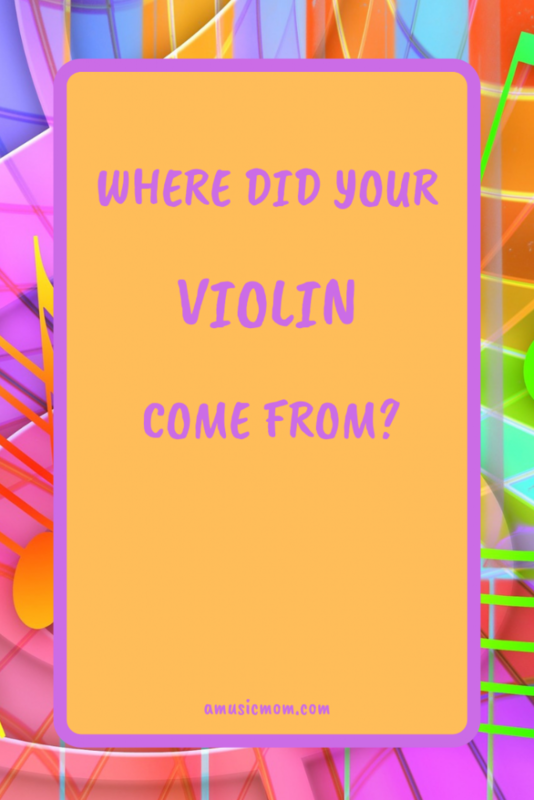 Where Did your Violin Come From? You should know something about the instrument you play. Like a little bit of its history. So, where did your instrument come from? Did it just appear one day? Did some guy wake up one morning and decide that he was going to make a violin that day? What led to the development of today’s violin? Violins are instruments that have strings. There have been instruments with strings for thousands of years! But violins have strings that are played with a bow – that’s different from instruments with strings that are played by plucking the strings. References exist to bowed string instruments at least as early as the 9th Century A.D. And these references come from all over! There were bowed string instruments in Mongolia, Persia, Spain, Poland, Bulgaria, Russia, Finland, France, China, and India. But none of these early instruments were really like the violin. Which instrument provided the direct link to the violin? Good question – and there is not a definite answer. The two most likely answers are the viol (viola de gamba) or the lira de brascia. Neither of these groups of instruments were shaped like a violin, but they were based on some similar ideas. Viola de gambas were played in upright positions, sometimes even between the legs. (“gamba” means “leg). Lira de brascia instruments were held in the arms (“brascia” means “arm”). For that reason, some think the lira de brascia was the direct link to the violin. Enter the Amati family in northern Italy in the 1500’s. Andrea Amati was a luthier. (Originally a luthier was a lute maker, or lute repairman. Today that is the term used for those who make violins.) He was the one responsible for making the first known four-string violin. He was commissioned by a member of the famous (and wealthy) Medici family to build a four-string violin. He must have done a good job because he and his family went on to make a name for themselves building many famous violins. The Amati family of violin makers were responsible for establishing the basic proportions of the violin – very similar to the instrument you have today. At some point he started using a mold, or a form, for his violins. This allowed him to be even more precise in his measurements. Quality control for his violins. The most famous violin maker in the Amati family was Andrea’s grandson, Nicolo. The Amati family also taught others to make violins through an apprenticeship program. Two other famous violin makers learned under the teaching of Nicolo Amati – Giuseppe Guarneri and Antonio Stradivari. Ever heard of either of them? I hope so! A few of their violins are still in use today – and they are worth millions! Many violins made since them are patterned after the designs and techniques of either Guarneri, Stradivari, or Amati. The label on the inside of your instrument might have one of their names on it – meaning your instrument was made in the style of one of those former makers. Let’s play a little word association game for a minute. What are the first things that come to your mind when you hear the word “violin?” Instrument? Practice? Expensive concert? Exclusive? Lovely sound? To our minds today, violins are associated with concert halls, high class performances, etc. But it wasn’t always that way. Originally the instrument was associated with the lower classes. It started out as an instrument for professional street musicians. Other performers who used the violin were servants, folk musicians, performers of dance music. Over time the violin became more accepted by the upper classes. By the early 1600s the violin was being used in orchestras. Claudio Monteverdi was one of the first composers to include the violin in his scores. Has your violin teacher ever said anything to you about your posture? Like, maybe, every week? Good thing your teacher didn’t have to deal with early violins and violinists! No good posture solutions existed then! During the time of Bach (Baroque era), chin rests and shoulder rests did not exist. Violinists held the instrument angled toward the floor. That limited the use of the arm holding the violin, so no one could play in any of the upper positions. The bows of the time were shorter and lighter, limiting the sound of the instrument. 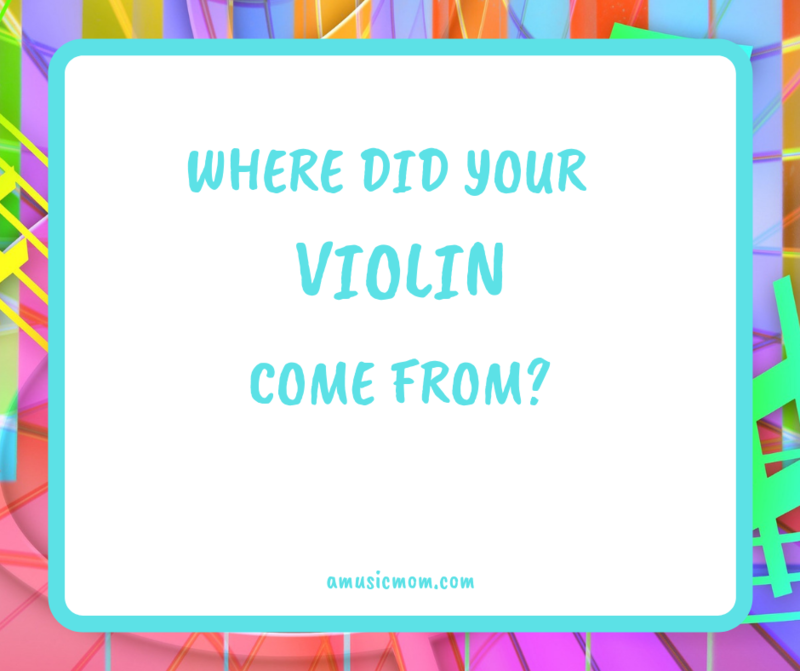 Early violins produced a sound that was soft, rough, and muddy. Baroque violins did not sound like the violins we are used to hearing today. Innovation to the rescue! How did we get the violins that we hear today? What caused the sound to change, the technique to improve, the comfort level and posture to become bearable? In 1726 Francoise Tourte redesigned the violin bow. He changed the bend of the bow, so it arched backwards. He also standardized the length and weight of the bow. These changes in weight, length, and balance allowed the violin to sound with more power and brilliance, especially in the upper ranges. Another great improvement came in 1820 when Louis Spohr invented the chin rest. Can you imagine playing your instrument without a chin rest? The addition of a chin rest allowed players much more comfort in holding and playing the instrument. It also allowed for a great advancement of playing technique – the left arm was much freer, so the fingers were freer to move up and down the fingerboard. The sore necks of violinists have been thanking him ever since! And then there were changes to the instrument itself. In the 1800s the fingerboards were lengthened, which allowed players to use more of the E string. The bridge was raised, and the fingerboard was tilted and raised, giving a greater volume and brightness to the sound of the violin. Even the strings got in on the improvement action. Originally violin strings were made of sheep or lamb gut. As early as the late 1600s, though, violin makers started using G-strings of gut wound with silver or copper. By the late 1800s violinists were experimenting with steel strings. This was especially true with the E-strings. They were the thinnest strings and, therefore, the most easily broken. The two World Wars had an impact on violin strings. The wars caused great disruption to the animal trade – not so much sheep gut available for strings. Also, the wars brought about advances in the steel industry, so it was easier to produce the thin strings needed for violin. But many players didn’t like the sounds produced by steel strings. By the middle of the 1900s players were beginning to use, and like, synthetic strings. Dominant strings made by Thomastik were the first big players in the synthetic string market. D’Addario began marketing strings for violins made of the same material as the strings used for tennis rackets. Now, most violinists use synthetic strings. Does your own violin have its own story?